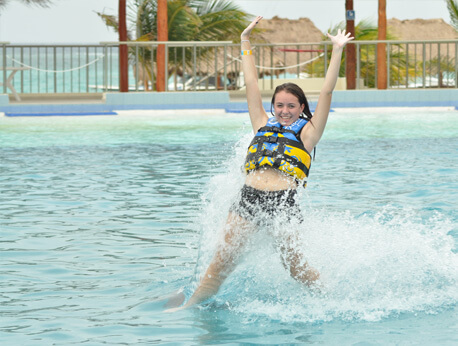 There are enough adventures, entertainment, and interactive activities during the Royal dolphin swimming tour to make your Playa del Carmen vacation a memorable one. You may have encountered dolphins at an exhibit or during a dolphin watch tour, but this experience will give you an up-close experience that you will never experience anywhere. Swim, play, hug, and kiss these cute mammals in a natural habitat and enjoy some beach adventure at the Maroma beach. A one-of-a-kind tour will make your vacationing experience even more memorable and fun-filled. If zip-lining or skydiving are not your cup of tea, then swimming with some cute and cuddly dolphins may excite you. During your visit to Playa Del Carmen, experience this unparalleled opportunity by taking a Dolphin Royal Swim tour. Swim with dolphin programs are offered for guests of all ages. However, there are some safety recommendations for pregnant women. The tour is not recommended for pregnant women who are five months and up. All the tour participants are advised to wear their lifejacket throughout the swimming adventure. Those with certain health conditions and disability can request for assistance by calling the tour support desk while making the reservation. Adults, and kids of age 6-12 are welcome to join this adventurous tour and enjoy a number of activities with the dolphins. During the tour, guests will enjoy kissing, hugging, shaking hands, and more with our dolphins. One of the most interesting activities is the foot push, which involves two dolphins pushing you from your feet as they swim speedily through the cerulean waters. After the initial tour briefing of 15 minutes, each guest will get 50 minutes to enjoy with the dolphins. This entire activity and swimming program takes place in a special underwater setting featuring a dolphin habitat in Punta Maroma. The tour includes round-trip transportation to many Riviera Maya hotels from Punta Maroma. After this enjoyable and unforgettable experience, guests can relax and enjoy some hearty lunch included in the tour package. With five different menu choices, you will surely find something appetizing for your palate. Just sit back and relax in the onsite Cocoteros restaurant, and enjoy anything from the menu after your dolphin swim and activity program. Once you arrive at the location, you will get some time to store your belongings, put on the life vest, and get ready for the adventure. The tour also includes beach club access to use the lounge chairs, lockers and showers before and after their activity. Plus, guests will get complimentary beach access after their program too. Maroma beach is one of the best photographed and scenic beaches in Playa del Carmen. Whilst on vacation you can lay in the pristine waters, enjoy some relaxing stroll, or just soak in the sun on the pure white sand. Infants from 4-5 need to pay an additional cost of $16.00 USD for transportation.